In the second year of New York State’s property tax cap, proposed school district budgets will be subject to an average tax levy limit of 4.6 percent—more than double the statutory base cap of 2 percent and well above the 3 percent average limit for school budget proposals last year, according to data from the state comptroller’s office. The additional increase is driven entirely by a provision of the 2011 tax cap law that excludes a portion of increased employee pension costs from the limit on tax levy increases. 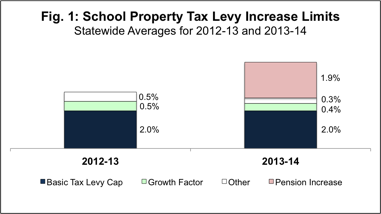 Without the pension-related increase, the 2013-14 levy limit statewide would average 2.7 percent, including all other district-specific exclusions and allowances for voter-approved capital expenses and physical additions to the local tax base, along with factors such as growth in the tax base and net changes in the value of payment in lieu of tax (PILOT) agreements. The partial pension exclusion raises 2013-14 tax caps the most in New York’s poorest school districts, while having less of an affect in wealthier districts. 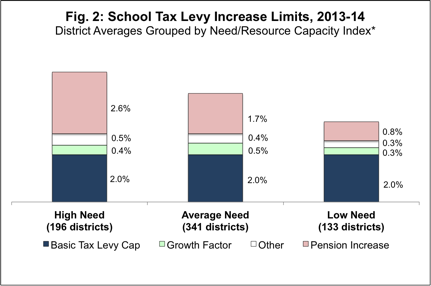 The average levy limit is 5.5 percent for state-classified “high-need” districts, 3.4 percent for “low-need” districts, and 4.6 percent for “average” districts. At least 35 school districts indicated to the comptroller that, as of March 1, they planned to seek an override of the tax cap—which requires a 60 percent supermajority of voters to pass. Proposed school tax hikes below the cap require only a simple majority. Any district that fails to pass its budget in two submissions to voters, regardless of the size of the proposed tax increase, will have an allowable levy increase of zero—a hard tax freeze. As shown in Figure 1 above, the growth factor due to new construction added about 0.5 percent to the statewide average school tax cap in 2012-13, and about 0.4 percent for 2013-14. Other exclusions and modifications, including voter-approved capital construction costs and net changes to PILOT agreements, amounted to 0.5 percent last year, dropping to an average of 0.3 percent for 2013-14. On top of next year’s average 2.7 percent levy limit, including basic cap and other factors, the pension exclusion adds an average 1.9 percent statewide, bringing the total of 4.6 percent. [i] The average increase in the effective tax cap due to the pension exclusion varies depending on the wealth and need of each district, as calculated in the state school aid formula. A growth factor reflecting the “quantity change” in taxable property values in the base year. The growth factor is based on actual physical changes to taxable property—such as new construction of homes, stores and offices—and not mere changes in the assessed value of existing, unchanged taxable properties. These taxes can be added to the allowable (capped) levy in the first year after the value of the change is reflected on the local tax roll. Tort settlements or awards whose costs exceed 5 percent of the tax levy in the base year. A tort is a type of lawsuit seeking damages for personal injuries caused by negligence. 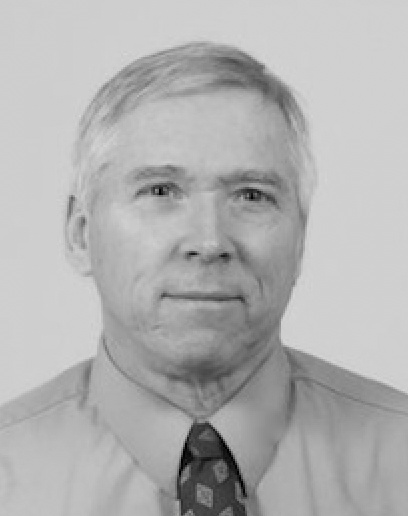 Tort settlements exceeding 5 percent of a jurisdiction’s tax levy are rare. Capital costs (including debt service) for school districts, which cannot borrow money for capital purposes without voter approval. A carryover of up to 1.5 percent of unused tax levy growth to the following year. For example, if a city raises taxes by 2 percent in a year when its cap is 3 percent, 1 percent can be added to the subsequent year’s levy cap. Pensions for employees of local governments covered by the tax cap are financed by annual taxpayer-funded contributions to statewide public pension systems. The taxpayer-funded employer share of pension contribution rates is calculated as a percentage of the total salaries paid to employees in each of the three pension plans—the New York State Employee Retirement System (ERS), the Police and Fire Retirement System (PFRS) and the New York State Teachers Retirement System (TRS). Employer contribution rates have been rising in recent years and will continue to rise in the next several years, mainly as a result of increases in pension benefits and market losses sustained by the pension funds over the past decade. Pension costs attributable to pension contribution rate increases of more than two percentage points in a given year are not subject to the new property tax cap. That provision was effectively moot for school districts last year, when the TRS pension contribution rate rose by less than one percentage point. But for 2013-14 payrolls, the TRS rate is rising to 16.25 percent from 11.84 percent, an increase of 4.41 percentage points. School districts can thus exclude from their tax caps an amount equal to 2.41 percent of their TRS payrolls. For a hypothetical employer with a $10 million TRS salary base, the exemption is $241,000, or 2.41 percent of $10 million. All other pension costs must be covered under the basic cap as adjusted for the other exclusions and modifications listed above. In every district, teacher salaries are the largest component of school spending. In “high need” districts, state aid covers more than half of all expenses, including salaries. In wealthy districts, which receive minimal state aid, taxes cover the lion’s share of all expenses, including salaries. But while financing sources can differ significantly among school districts, the pension exclusion from the tax levy limit is a uniform percentage of covered payroll for all districts, regardless of relative wealth and financial “need” as defined by the state aid formula. As a result, rising pension costs generally add the most to the levy limit in the poorest school districts, while raising the tax cap the least in wealthy districts. Poor districts also have lower property values and higher effective school tax rates than wealthy districts. Thus, the pension exclusion in the tax cap law effectively makes it easier for school districts to raise taxes on property owners who can least afford it. The average levy limits, grouped by major financial need categories, are depicted below. There are also regional variations in the levy limit, summarized in county-by-county averages below. New York’s new “2 percent tax cap” varies by locality every year, based on the local application of exclusions and additions in the law. (As Governor Cuomo frequently points out, the law actually does not “cap” taxes in the strict sense of the word, because it allows for an override.) The exclusions and allowances are intended to ensure a local share of funding for voter-approved capital projects, to allow districts to carry over a portion of unused cap space from one year to the next, and to encourage local development that will boost tax revenues. The provisions regarding PILOT payments, while complex and confusing to many, ultimately are designed to prevent local officials from manipulating PILOT agreements in such a way as to circumvent the cap. The levy limit data for 2013-14 illustrate why Governor Andrew Cuomo chose not to exclude pensions from the cap in his original bill. The pension provision—added at the insistence of Assembly Speaker Sheldon Silver—diminishes the protection the law was supposed to provide for some of the state’s poorest taxpayers. In yet another unintended consequence, some districts could take advantage of the pension exclusion to seek a simple majority vote for a higher levy increase than the cap would otherwise permit—and then opt into a pension “smoothing” plan that will allow them to defer most of the added pension cost the exclusion was supposed to pay for. The pension exclusion undermines the effectiveness of a tax cap law that is otherwise well structured to balance tax restraint with flexibility for local voters in the long run. [i] By comparison, the latest average tax levy growth limit for counties and municipalities was 3.6 percent, according to the comptroller’s data.